I am honored to be part for the first time of one of the largest Web Marketing events in Europe. 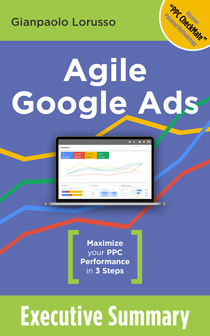 This year I will be speaking there about my method of evaluating AdWords optimization level and I am really happy to have the possibility to offer a very good discount to all of you interested in joining us on 9/18. BrightonSEO attracts almost 2.000 SEM professionals with a first class selection of speakers coming from all over the world in 7 parallel sessions covering SEO, PPC, SMM, Content Marketing, Digital PR & Analytics. The day before the event on 9/17 there are 9 advanced training sessions covering all the topics of the conference + Video Marketing, Copywriting, App Store Optimization and several specific Search Engine Optimization topics like Link Building and International & Local SEO. Last year I have been there and it was really impressive, both for the level of speakers (certainly higher than in many other much more expensive events) and by the fantastic location. Besides the event, the city itself and the Brighton Dome surely deserve a visit, especially if your are hanging around London on 9/17-18. Here is the link to get your 25% discount to register to BrightonSEO.